AVG Anti-Virus Free Edition is by far the most popular free anti-virus program for all editions of Windows 7. Running in background, AVG detects known malware by its signature and keeps an eye on applications' behavior to block suspicious activity. You also get real-time protection against Web infections from AVG's SmartScanner technology, which scans incoming Web traffic to block potential malware or attempts to hijack your Web browser. Avast! Free Antivirus provides basic anti-virus and anti-spyware protection on multiple levels. It guards you against threats attempting to enter your computer via email, Web browser, removable media, and other channels. Avira Free Antivirus is another Windows 7 antivirus program rated highly by users and reviewers. It operates in scan-only mode, lacking the real-time defenses of the premium edition. But it is lightweight, fast, and very good at rooting out malware infections. MalwareBytes Anti-Malware (MBAM) offers a free edition that eliminates threats as they are reported in the wild. Its malware signature database is updated several times a day to keep ahead of the ever-mutating and new threats that appear. Microsoft Security Essentials compares surprisingly well to third-party anti-virus software for Windows 7 and earlier Windows versions. With MSE, Microsoft seems to finally take security seriously. This free anti-virus program scores high in tests of its ability to detect and remove threats, and it is user-friendly. Free is good, but so is gratitude. 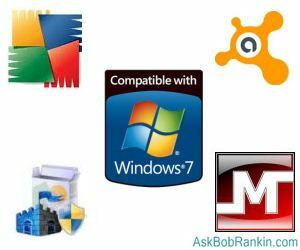 The developers of free anti-virus software for Windows 7 (or any freeware, for that matter) should not be taken for granted; without your registration fees they may go out of business, leaving the free software landscape smaller. Most free anti-virus software developers offer prices and upgrade terms that much cheaper than purely commercial programs such as Norton Antivirus and McAfee. So when you find a free anti-virus program that is right for you, remember to "tip" the developer. Registration also provides enhanced anti-malware features, as well. Free anti-virus programs may provide only basic, after-the-fact protection. If your computer gets infected with a virus, the free program will root it out. But registered editions actively guard your machine's vulnerable points constantly, detecting malware in email attachments, archived files, and other sneaky channels by which bad guys try to infiltrate your machine. Some of these advanced features are enabled in some free anti-virus editions, but you get all of them when you register. Do not try to get complete anti-virus coverage by running several different free anti-virus programs at once. That slows your system down, generates conflicts between programs that can lead to false positives or system crashes, and can render some of your favorite applications inoperable. My recommendation: Choose one good anti-virus program for real-time protection and register it to unlock all of its power. Most recent comments on "Free Anti-Virus For Windows 7"
So many programs work for Win 7 32 bit but not Win 7 64 bit. Do your choices above all work on 64 bit machines? Please discuss software for 64 bit machines. Can you run AVG (Free Edition), Malwarebytes, Spybot Search & Destroy, and Spyware Blaster on the same computer without them comflicting with one another? I have been using the free version of Avast! for years and I can honestly say that I have never been hit with a virus. Even the free version sometimes gets updated 2 to 3 times a day! Great price (free) and an even greater product! I´ve been using it by years. I've yet to see a detailed technical explanation of these components, and no one I know of seems to have thoroughly tested the efficacy of these components. Yet I believe this is the best free product of its type currently available. Avast Free Anti-virus 6 and the new version of Microsoft Security Essentials have beautiful and user-friendly environments and work fine. Avast also has a Windows start-time scanner which can be scheduled for next system start-up. Hi Bob~ At the moment I use the new aVast, but I'm seriously thinking of using Microsoft's antivirus software, after their IE9 is no longer in the beta stage and I install it. All the newsletters I get recommend Microsoft's antivirus software, including CloudEight's Info Avenue premium that usually plugs aVast. I have used AVG before, and I don't like it. My wife used to have AVG installed in her PC. She took her PC to a repair shop here to have the tower fixed, and when we got it back, we noticed right off that he removed aVast, and installed AVG. Could kick-backs have been involved? Can that be done without permission? I think AVG is bloatware and it uses too much system resources. The free version (never seen the premium version), constantly uses the dreaded nag-screens that nobody likes, wanting you to upgrade to the premium version, or add other AVG features to the toolbar, etc. I use Microsoft Security Essentials. It works for me and it is easy to use. Hello! It's a long time I receive your newsletter about how to do this and that on my laptop. It is very helpful and full of good information. One question: What about ComboFix, used as , and some are saying it is better than MBAM. Is this true? All the best and keep it this way. I have been using Avast free edition for years. It has caught every virus that tried to get on my system. I also use Spybot Search and Destroy. I will continue to use both of these. They are 2 great products. AVG was very good until one of their minor version upgrades that caused me problems (long since fixed in later versions). In the meantime, I tried the other two, Avast and Avira, which were also good. BUT... although rare, there are occasions when I need to turn off it off, and such function seems to be no longer available. The only way I've found to turn them off is to completely uninstall the entire program. Very inconvenient, especially to go through reinstallation a short time later. With MSE, I can turn it off with a click, as needed, and start back up moments later with a minimum of fuss. Oh, yeah, and later versions of AVG's constant badgering to upgrade just isn't worth the benefits, although otherwise it would be my first choice. Could you comment on Firewalls for Win 7, please? at home I use avast! on one and MSE on another computer... both work fine - no viruses so far (or maybe I am lucky, or maybe I just don't know :-) ) at work we use McAfee because it has centralized management of the antivirus software on all 500 PCs. And we pay for it :-) . do you know maybe some free antivirus that do centralizied management? One correction to your article: I've been using Avira Antivir free edition for a few years. Your statement "It operates in scan-only mode, lacking the real-time defenses of the premium edition." is incorrect. A difference between the free and paid versions is the pop-up advertising window in the free version each time the virus definitions automatically update. The additional capabilities of the paid version are listed here: http://www.avira.com/en/avira-free-antivirus However, the free version has very effective real-time protection of all files read, written, opened, and downloaded. It also has a real-time Heuristic capability (called "AHeAD"). i think its the best. i just cant rely on just antivirus at all even if its free or purchased. free antivirus is good enough if u are using pirated windows. but when it comes to genuine windows i want genuine thing. I use microsoft Security Essentials and the Firewall I use is the Free Zone Alarm Firewall. This detects both in and out traffic. Can set each program you have installed to block calling home base if you wish. The Microsoft fire wall is rubbish and I disable it and use my preference ZA. Tried to upgrade from Windows 7 to 10 without results, now says "This Copy of 7 is not genuine"